Street protests that started in the north-eastern Sudanese city of Atbara over bread and fuel price hikes on 19 December have snowballed into weeks of widespread anti-government protests demanding regime change. Popular street protests in Sudan are not unusual. What’s significant about this one is the nature of the protests’ leadership, the underlying economic and political drivers, and the demand for an end to President Omar al-Bashir’s three-decade rule. Since the independence of South Sudan, which led to the loss of significant oil revenue, Sudan has grappled with an ailing economy characterised by high inflation, depreciation of the Sudanese pound, a liquidity crunch and an increase in the cost of living. Rising prices of goods and services have become a regular occurrence. Commodity prices increased at various times during 2018, resulting in shortages and long queues. The December price hikes weren’t the first, and the subsequent mass street protests show an unravelling of the economy. This has been blamed on structural economic and political challenges, gross mismanagement of national resources and dwindling sources of national revenue. The protests have spread into al-Bashir’s strongholds and have become a major problem for the country’s leadership. Many thought his regime would not resort to brutality in order to protect the warmed relations with the United States and European Union. But the government, as in the past, has been largely dismissive and vague about popular demands, and security forces have used violence against unarmed protesters. Rights groups estimate around 40 deaths since mid-December. Police cells and ‘ghost houses’ are busting at the seams with more than 1 000 arrested protesters. Social media sites have been blocked and protesters have access only via virtual private networks (VPN). Sudanese have always protested when they’ve been unhappy with government performance and unsure of democratic avenues for change. Since the 2011 and 2013 protests, it has become clear that many Sudanese are looking for ways to change the al-Bashir regime. Dr Saif El Din Abdelrhman, a Sudanese academic based in Nairobi, told ISS Today that many had turned to uprisings because of the lack of options for demanding change. Is the current uprising the one that could end al-Bashir’s rule? For any protest to bring about change in Sudan, it would have to dislodge the government’s power base in the army and security apparatus, as well as the ruling coalition and the Islamic movement. As former vice president Ali Osman Taha has said, ‘the authorities have full shadow battalions ready to sacrifice their lives to defend the regime’. The current protests are having an impact on al-Bashir’s power. First, they spread from Atbara through the riverine areas largely perceived to be al-Bashir’s strongholds in northern Sudan, before reaching Khartoum and Omdurman. The 20 December torching of the ruling National Congress Party (NCP) headquarters in Atbara is a clear sign of the extent to which al-Bashir’s support has eroded in stronghold areas. To some opposition actors, the weight of the current push to get al-Bashir out started in his own backyard, and so is significant. Second, it’s not the opposition who is leading the protests, but the country’s youth groups, professional associations, doctors association and university lecturers, among others. The overall aims of the protests have morphed from bread-and-butter issues to political demands for the government to change. Apart from making it difficult for government to clamp down on the protests, the emergence of such leadership is scuttling the advantage al-Bashir previously had – a weak and fragmented opposition. 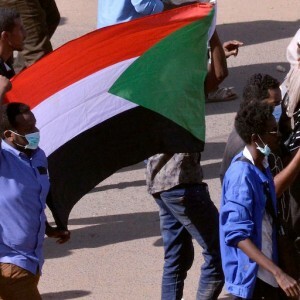 The exit of Sudan Reform Now and the Umma Party from the ruling coalition to align with the demands of the protesters is also a sign of al-Bashir’s weakening political base. Even some in al-Bashir’s own party see him as a liability, it is believed. Al-Bashir’s Islamist base has started showing signs of wearing thin too. Some religious leaders have spoken out against the excesses of state forces against protesters. Citizens are also holding some imams accountable for either supporting the government or remaining silent on the plight of protesters. It is however difficult to imagine any radical outcome of the protests without the support of the army. It is also unclear how long protesters will continue to pour out onto the streets if the security forces persist in their brutality against them. If the orientation of the army, the National Intelligence and Security Service, and other security apparatus start changing, al-Bashir’s days will be numbered. But until that happens, he will remain defiant and could survive this round of protests. So far, the support of the army and security forces – on which al-Bashir’s government has depended over the years – remains intact. It is too early to know whether al-Bashir will embark on governance reforms to appease protesters. Even without any change though, the current protests are significant. The government won’t overcome structural economic challenges with only emergency policies, even if the protests subside. Extensive political and economic reforms are essential. The current strength and resolve of the masses are strong indications that the conditions for comprehensive reforms exist – even if those in power think they’re not yet sufficient for the president to step aside.